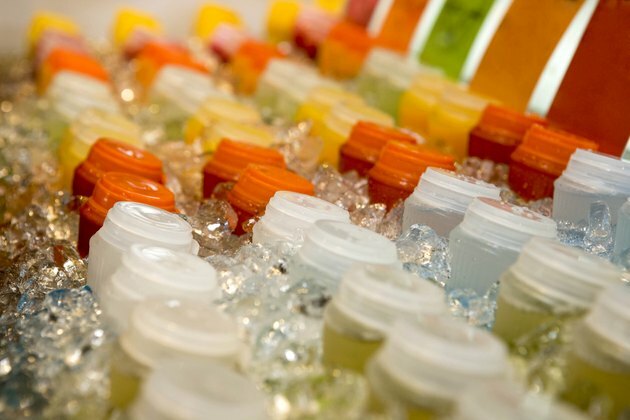 Sales of sports drinks in the United States are expected to reach $2 billion by 2016, as reported by Boston.com in 2012. Americans certainly seem convinced these hydrating drinks offer plenty of benefits. Most people don't need to guzzle electrolyte-enhanced beverages, such as Gatorade or Powerade, on a regular basis. But, if you work out in extreme heat, exercise for long durations or find yourself dehydrated, these drinks may help replace lost nutrients and provide energy. Most sports drinks are artificially flavored water containing added electrolytes. Electrolytes are minerals, including sodium, calcium, chloride, magnesium, phosphorous and potassium, which you naturally lose as you sweat. They assist in proper muscle function and must be replaced if you sweat a lot or are exercising at a relatively intense level for more than an hour. Consuming a sports drink is one of the easiest ways to restore your electrolyte balance, especially when it comes to sodium and potassium. If you go out for a stroll or do a light lifting session at the gym, you probably won't sweat enough to warrant electrolyte replacement. Most sports drinks contain carbohydrates in the form of simple sugars. For athletes exercising longer than 90 minutes, these carbohydrates absorb quickly and convert readily into fuel. Sports drinks, such as Gatorade and Powerade, are considered "isotonic," meaning they contain a 6 to 8 percent carbohydrate solution. This percentage of carbs maximizes fluid absorption and energy conversion because their concentration of salt and sugar is comparable to that found in the human body, notes the website Diabetes.co.uk. A study published in the "Journal of the International Society of Sports Nutrition" in 2014 showed that isotonic drinks improve the body's ability to oxidize, or break down, carbohydrates during exercise, thus potentially enhancing performance. Sports drinks with 1 to 3 percent carbohydrates provide less energy, but do help with fluid absorption. Drinks that contain more than 10 percent carbohydrates, including soda and some energy drinks, may cause digestive distress and slow your rate of rehydration. In some cases, a sports drink can serve as a pre-workout energy boost if you haven't eaten in several hours. For example, if you exercise first thing in the morning but don't have time or can't tolerate a pre-workout snack, a sports drink provides some fuel for your session. After a hard workout, you need carbohydrates to refill the stores of energy you just burned -- especially if you have another workout on tap later in the afternoon or the next day. A bottle of Gatorade or Powerade can serve as a quick source of these post-workout carbs. After your workout, you'll also want to have a serving of protein along with the sports drink to help repair muscle fibers and stimulate muscle growth. For a moderate-intensity workout lasting less than an hour, plain water will do. A sports drink offers little benefit when it's consumed outside of a workout, only adding extra calories and sugar to your diet. You're better off drinking water, low-fat milk or an occasional 100 percent fruit juice at meals and snack time. The Guardian: Sports Drinks: Vital for Hydration or a Waste of Money? Are Carbonated Beverages Bad for Athletes?